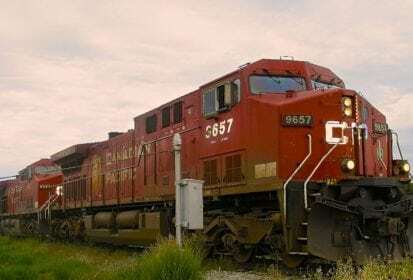 Increased revenue from grain handling — albeit on a slightly lower overall grain handle — helped Canadian Pacific Railway improve its fourth-quarter and year-end gross for 2018. Calgary-based CP on Jan. 23 reported overall net income of $545 million on $2.006 billion in revenues for its fourth quarter ending Dec. 31, down from $984 million on $1.713 billion in its year-earlier Q4. Its full-year 2018 ledger showed $1.951 billion in overall net income on $7.316 billion in revenue, down from $2.405 billion on $6.554 billion in 2017. The company noted its fourth quarter alone included record operating income (revenues less operating expenses, before income tax and “other” expenses) of $874 million, and record adjusted diluted earnings per share of $4.55. CP, in its year-end report, didn’t break out its numbers for Canadian grain, but reported total Q4 grain handle of about 114,900 carloads, down slightly from 115,100 in its previous Q4. Full-year grain handle for 2018 came in at about 429,400 carloads, down three per cent from 440,700 in 2017. Revenue from grain freight for 2018 Q4 reached $453 million, up $28 million from the year-earlier period, for revenue per grain carload of $3.945, up $255. Full-year grain revenue for 2018 reached $1.566 billion, up $34 million from 2017, for revenue per carload of $3,645, up $168. Fourth-quarter and full-year revenue per carload rose across all CP’s freight categories, including fertilizers and sulphur ($4,450, up $332, in Q4, and $4,186, up $8, for the year) and potash ($3,126, up $210, in Q4 and $3,071, up $83, for the year). For full-year 2019, CP said it expects “double-digit” growth in adjusted diluted earnings per share, compared to its full-year adjusted diluted EPS of $14.51 in 2018. It also expects “mid-single-digit” growth in traffic volumes in 2019, as measured in revenue ton miles (RTMs) — a transportation industry metric calculated by multiplying freight weight by the number of miles the freight is transported.